I am not a morning person, and my boys are not morning people either. 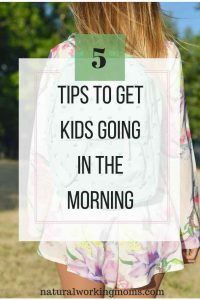 So we definitely need these tips to get kids going in the morning. There have been so many hacks that we have implemented since mornings are not our thing, but the kids still need to get to school and I still need to get to work. How about you? Do you need some help to get kids going in the morning? This is a major help to get the kids going in the morning, get everything you can, done the night before. Lay out the outfit your kiddo is going to wear in the morning; if your children are older they can pick out their own outfit. And for your peace of mind, let it go if their outfit doesn’t match or doesn’t go together. Does it really matter as long as they are covered? Make sure you and your kiddo also check the weather. Wherever you are at, the weather is probably changing fast. You don’t want to send your kid to school in shorts when it is supposed to snow (Guilty of this!). I have our local weather channel app on my phone so I can always check the night before what the weather will be. I must confess, I would always forget to put my son’s morning snack into his backpack, until I started packing his bag the night before. Now, we get all homework and everything done and then all the things go in the backpack. The snack, the homework and the reading book all go in the night before. Something new we have this year is the instrument. The trumpet also has to be put by the backpack the night before so we don’t forget it. We don’t do cold lunches, I am a mean mom and make my kids eat hot lunch every single day (no mom judging). This is a tip in itself, that sometimes the lunch from home has to go, because we are busy working moms, and we don’t have to time to be worrying about cold lunch. Especially when there is a perfectly good lunch served at school. But, if you do make lunches for your kids, make them the night before so they are ready to go in the morning. So once you have packed the backpack and retrieved the instrument. You need a central place to put everything so it is not forgotten. We have a bench right by the front door where the boys go out to get on the bus. We gather everything there so the boys know exactly what they will need to grab in the morning. I even put their jacket (if necessary after you have checked the weather) and their shoes, right by that bench. So when the bus comes down the street, we aren’t searching all over for the other shoe. Something else we do to get kids going in the morning is to discuss the schedule, usually the night before. If my older son has show choir in the morning, we discuss what time he needs to get up so he isn’t late. And if my younger son has activities after school, we discuss what those are so he knows, that the next day he will have to come home right from school and do his homework so he is ready for his activities. 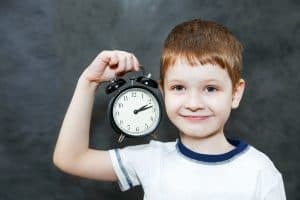 If your kids are older, you can get them an alarm clock so they can take responsibility for their schedule. After we discuss what time they need to get up, they can set their alarm clocks and make sure they are up by then. It is my older son’s responsibility to get up with his alarm clock. But, sometimes, you need to lower your expectations for your kiddos. We all sleep through our alarm sometimes, so I will wake him up if he doesn’t wake up. I try very hard to keep this rule in place. Because if the boys play their video games in the morning before school, then they get distracted and forget to do things, like eat breakfast. We definitely try to keep these to a minimum. These games just mess with the whole morning schedule. These are 5 things that we do (plus some additional ones) to get kids going in the morning. I am always open to the tips that other people use if you, like us, are not morning people.